It’s a small tree by most standards, its stature reduced in height by 5 feet several years ago by a hungry, marauding bear. It stands quiet and unassuming in the middle of the orchard, overshadowed and dominated by its taller surrounding brethren. But what this misshapen dwarf of a tree lacks in size and dimension is more than equally compensated by its enormous productivity and extremely high quality fruit. I’m speaking of the little-known and underappreciated (Northern) Crow Egg, one of the more delightful apples in our extensive collection of American heritage apples. Before we begin a discussion of this fine summer apple, it’s necessary to address the confusion regarding this apple and the similarly-named but distinctly different (Southern) Crow’s Egg. The (Southern) Crow’s Egg is a uniquely shaped apple which originated in Connecticut in the 1700’s as Black Gilliflower. Because of its easy adaptability to the higher heat and humidity common to the Southern states, Black Gilliflower quickly became a Southern favorite and was renamed Crow’s Egg for its distinctive tapered, egg-shaped form. Note how the name of the (Northern) Crow Egg is in the singular tense while the (Southern) Crow’s Egg is referred to in the possessive tense. For the sake of clarity, in this discussion I will refer to the (Northern) Crow Egg simply as Crow Egg. Lee Calhoun, our mentor in all things relating to apples, offers a very brief description of Crow Egg in his wonderful book, “Old Southern Apples” (2011). He, too, distinguishes between the (Northern) Crow Egg and the (Southern) Crow’s Egg. 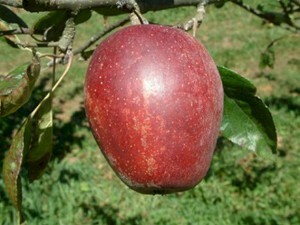 The Crow Egg is a small to medium, round, somewhat squat apple with smooth, shiny, bright red and yellow skin. The (Southern) Crow’s Egg is considerably larger in size with dull, brick-red skin and an unusual and distinctive oblong, sharply-tapered shape. Egg-shaped describes this apple perfectly! The Crow Egg ripens in mid-September, two weeks earlier than the (Southern) Crow’s Egg. For a late summer apple, the Crow Egg is an extraordinarily fine keeper, lasting well into late winter when properly stored. There is a long, documented history for Black Gilliflower (Crow’s Egg) which clearly establishes this as a true classic American heritage apple. However, when we examine the history of the Crow Egg, very little is really known about its origin. The Crow Egg is first noted in the 1847 proceedings of the Worcester County Horticultural Society of Boylston, Massachusetts. 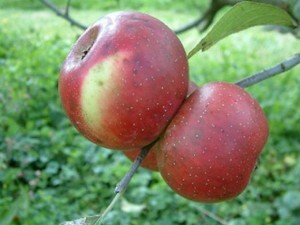 As described in the proceedings, John F. Clark of Worcester presented numerous varieties of apples including, “Black Gilliflower, (there are at least 3 varieties of Apples going by this name, the Crow Egg, which is the smallest, the true Black Gilliflower, and a third, name not known, which is the largest of the three. )” Apparently, Mr. Clark was the first and, perhaps, only person to exhibit Crow Egg in the long history of the Horticultural Society as there is no other mention of Crow Egg in subsequent proceedings. We grafted and transplanted our Crow Egg tree more than 15 years ago. Three years later the tree produced its first small crop of apples. I recall very well how impressed I was with the texture and flavor of the first apple I ate. The apple has a pleasing, sweet, mild flavor and a very firm, crisp texture that has a satisfying crunch when you bite into it. It is not a large apple by most standards, averaging around 2” in diameter. The smaller size of the fruit perhaps kept it from becoming a larger commercial success as growers and shippers tend to prefer larger fruits for consumer sales. A couple of factors that make this apple a particular favorite of mine is its productivity and reliability. There are not many other varieties that can match Crow Egg for its abundant yield. The fruits tend to grow in dense clusters which, in a good year, can place considerable stress on the tree when the limbs hang low and heavy with bushels of fresh apples. Hand-thinning of young fruits early in the season not only reduces the burden of weight imposed upon the tree but also helps to produce larger apples at harvest time. From the standpoint of the grower/producer, reliable annual production is one of the most important and critical aspects of fruit growing, especially with the challenges imposed by our evolving climate. Of the hundreds of apple varieties we raise at Big Horse Creek Farm, there are two selections that never fail to produce, regardless of ongoing weather conditions: Ingram and Crow Egg. Crow Egg is a very cold-hardy and late blooming apple, critically important features in growing zones like ours which are increasingly prone to late spring freezes. All too frequently we are having to deal with abnormal late winter events that directly affect the apple crop. Excessively warm temperatures in February are becoming commonplace in our area, creating conditions that stimulate early bloom-set which, in turn, becomes susceptible to damage and destruction from late freezes in April. We have had all-too-many years like this where upwards of 75% of the crop can be lost. But, no matter how severe the weather, we have never lost this apple. Every September we can always count on harvesting bushels of fresh, crisp Crow Egg apples! For the home grower with just a couple of trees to the commercial producer with thousands, the Crow Egg is the “almost perfect” apple which should part of the orchard setting. It is a truly marvelous apple that will not disappoint. Try it yourself; I think you’ll agree! Please share more of your thoughts on those wonderful old varieties you grow.
. I would like to buy a few of them.